La Harpe's 4th Annual Country Christmas was another success, despite a little rain and wind on Tuesday, December 1st. New this year were Olaf and Elf who showed up at the Dustin Berg building. As usual, the Sharpes offered the city the use of their wonderful Santa House where over a hundred pictures were taken of happy children with Santa and Mrs. Claus. The lighted parade drew many "oohs" and "aahs" from the crowd and the children stayed busy picking up the candy which was being tossed to the crowd. The evening offered many good places to do Christmas shopping as a third building was added this year to accommodate the many vendors who came. Free shuttle service was provided by the local chiropractor in his own tour bus, as well as in horse drawn carriages. "The Reason For The Season' was depicted in a "live" nativity scene in the park for the first time, which drew much attention. 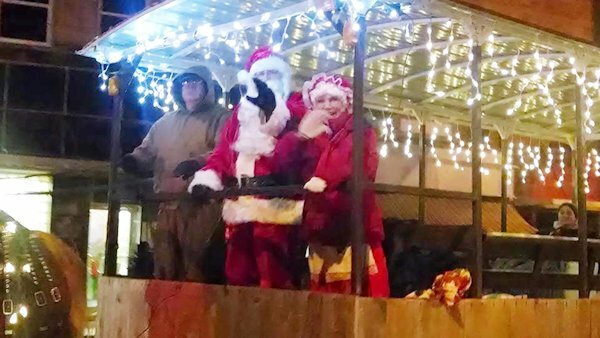 With the parade and all the buildings lit up and decorated so nicely, and with the live nativity and Christmas music, La Harpe was a festive place to mingle and visit with friends, do some shopping, and get into the spirit of Christmas. It's another great reason to love La Harpe.